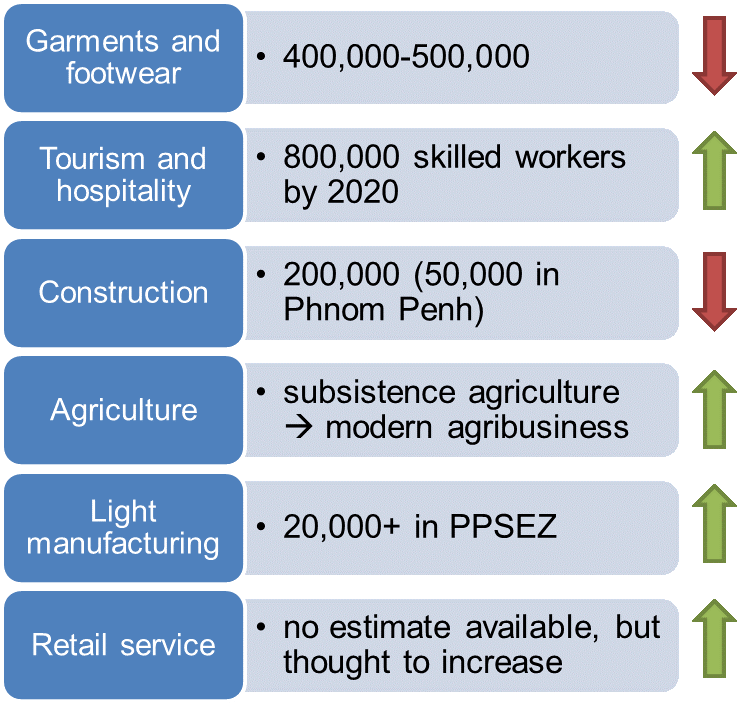 This is a quick summary of the Cambodia economy and outlook based on data as of Nov 2017 – GDP and GDP growth, sectoral composition, exports, services, labor market issues and business constraints. It’s not supposed to be detailed analysis, but may be useful timesaver for those interested in this topic. 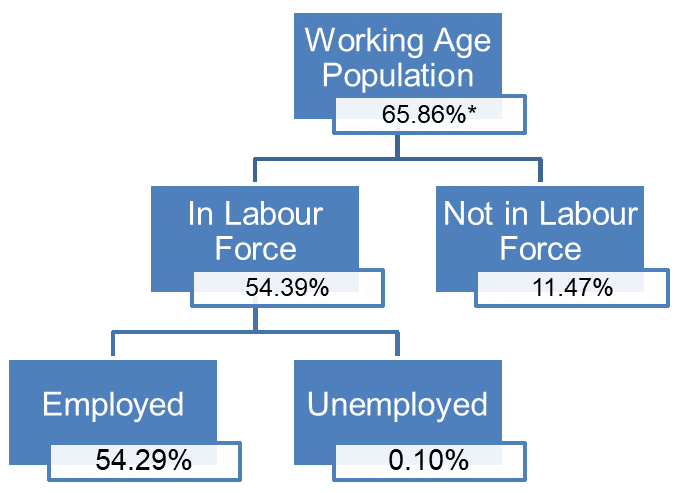 We put the slides together to facilitate discussion on employment opportunities for those at risk of trafficking and unsafe migration (at Chab Dai bi-annual members’ meeting 2017). It’s an area we’ve worked in since 2008, when we looked at economic opportunities for returning economic migrants, due to onset of the Global Financial Crisis. The slide deck PDF can be downloaded here. Cambodia’s economy has been expanding, and retains a positive outlook for 2017-2018 with 6.9% forecasted annual growth. 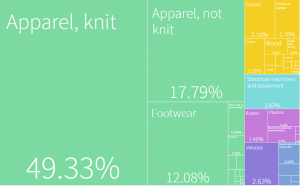 The high economic growth is a result of garment exports and construction activities. Garment sector secures an actual growth of 8.4% in 2016 compared to 2015 at 12.3% . The lower growth is a result of an increase in labour cost, and competition from other low-wage regional countries. 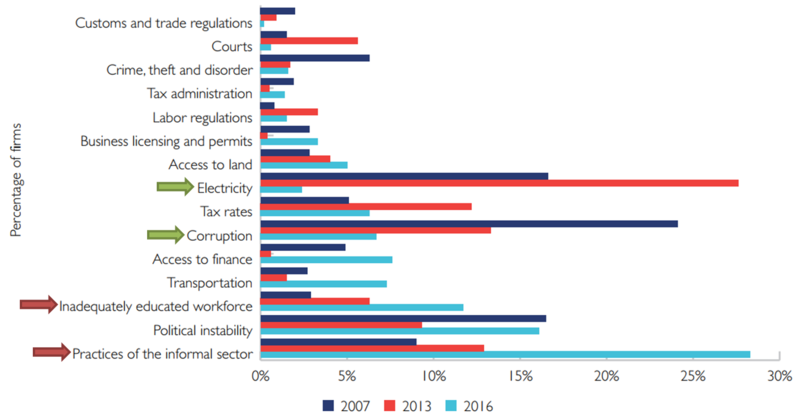 Construction sector has increased 2.5 times in 2016 compared to 2015 due to an increase in foreign direct investment; however, there is a concern in regards to over-supply which causes some projects to delay. As a high surge in 2016, there is a decrease in investment value in the first quarter of 2017, 22.3% Year on Year. Due to better weather conditions, the agriculture sector expanded in 2016 with an actual increase of 8.9% from 2015. Tourism experienced 5% growth in 2016. 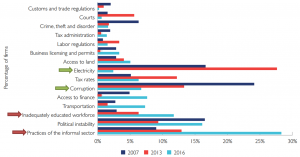 The service industry was a major driver of economic growth in 2016, a result of growing construction and tourism sectors. 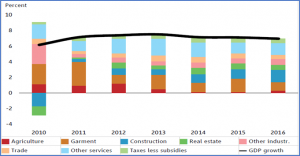 The Cambodia economy is going to sustain a considerably high growth rate in this year and next based on an increase in government spending. 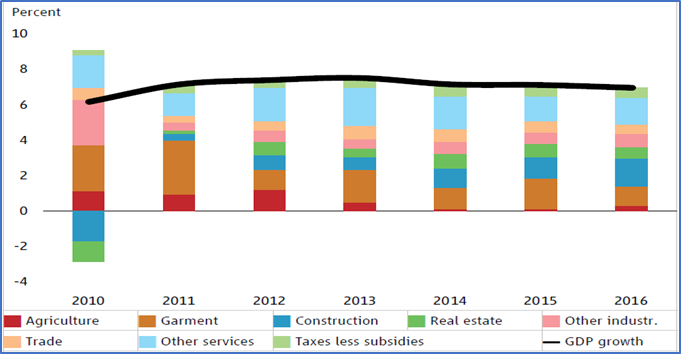 Garment sector growth is likely to decrease but would be offset by an increase in agriculture sector. Investment in construction sector might slow down but could be counterbalanced by tourism sector which requires government effort in increasing number of tourist visits. After Cambodia meets the LDC graduation criteria in two consecutive triennial reviews, the EU will initiate a three-year process for phasing out its Everything-but-Arms Agreement (EBA) with Cambodia. The US may take similar steps. 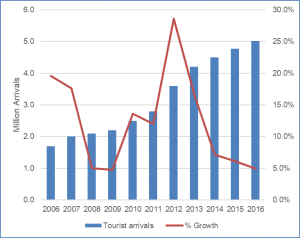 FDI inflows expected to remain a strong driver of growth. Increased economic role of China is likely. 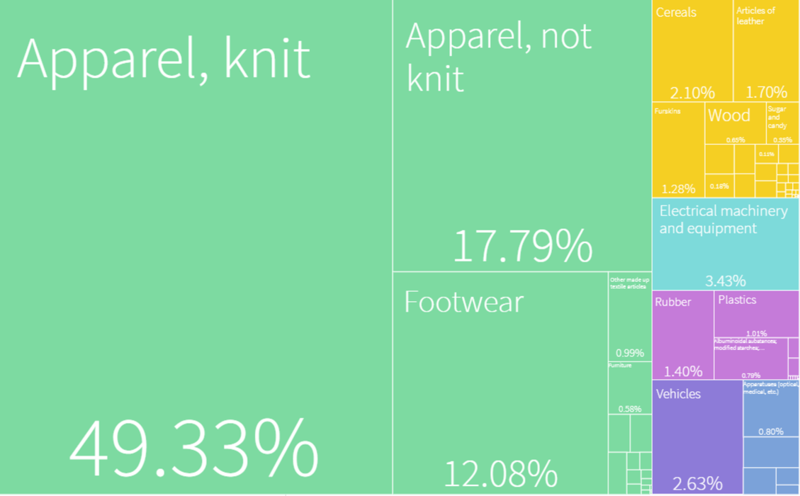 Cambodia’s gross exports in 2016 reached $12.5B, up from $3.9B in 2006, dominated by the garment and footwear sectors. 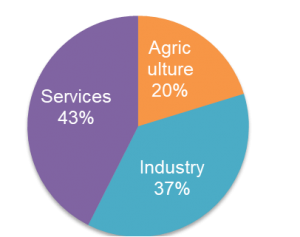 Export diversification is increasingly visible and will continue as the government’s Industrial Development Policy 2015-2025 gains traction, especially in light manufacturing and agriculture. 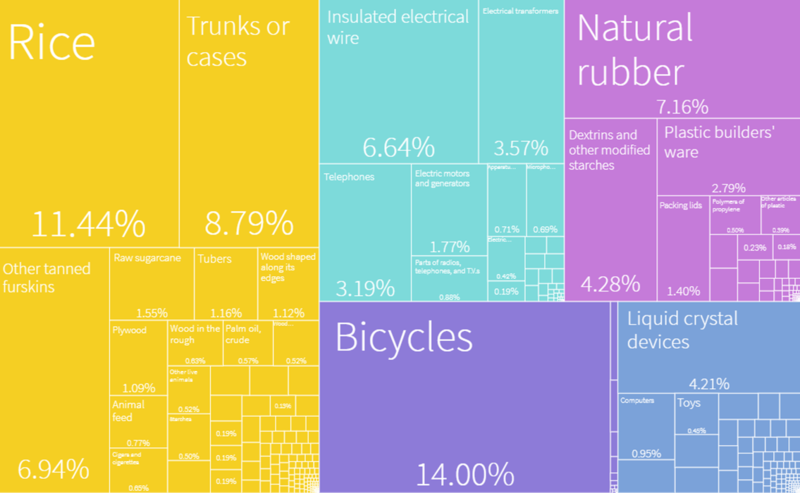 The following graphs exclude extractives (stone and glass, minerals, and metals). 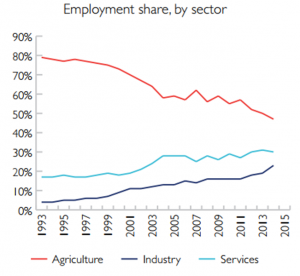 The service sector now constitutes around 43% of annual GDP, compared to 34% two decades ago, and is expected to keep growing. 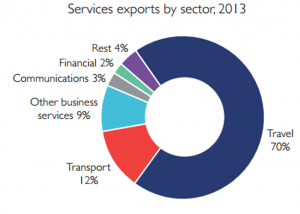 Major domestic components of the service sector include; Construction, Finance and banking, Retail and wholesale, Telecoms. 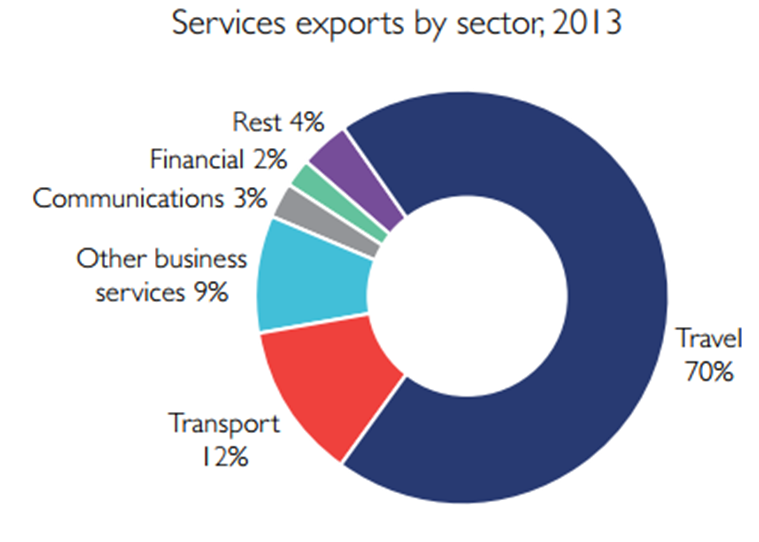 Tourism and hospitality is the largest, as well as the most promising contributor for growth in the services sector. Hotel and Restaurants were estimated to share of 4.4% of total GDP in 2017. There were more than 5 M tourists in 2017 compared to 1.7 M in 2006. Average length of stay is 6.3 days. 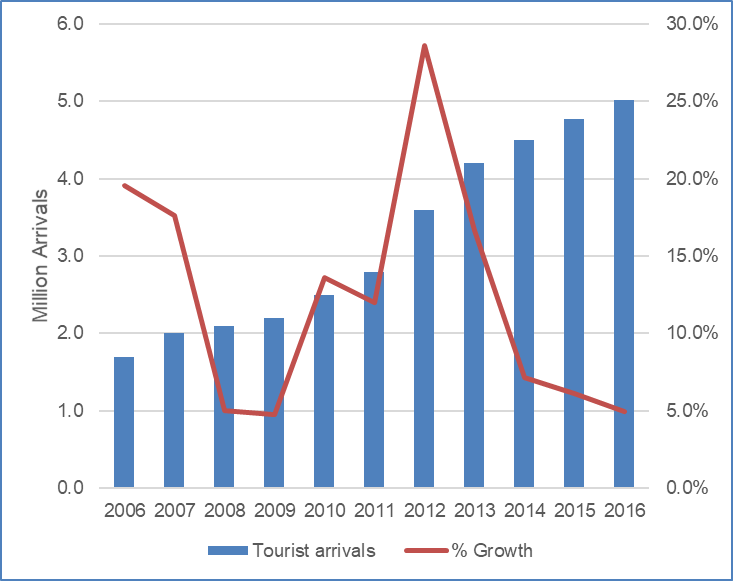 Tourist revenue was US$3.2 B in 2016 compared to US$1 B in 2006. More than 40% of tourist arrivals were from Southeast Asia. 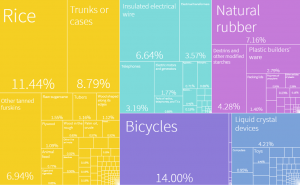 Additionally, there estimated number of expatriates in Cambodia was 80,000 in 2015. 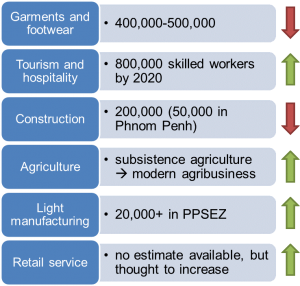 Cambodia has a working population of 10 million, 13% of which are in Phnom Penh with a majority working as service and sale workers as well as factory occupations. 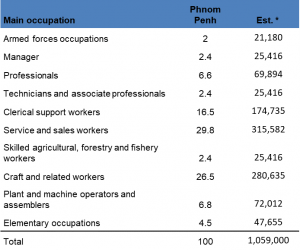 13% of total employed population is based in Phnom Penh, 1.059 million, of which, 71% are paid workers, 26.5% are self-employed. 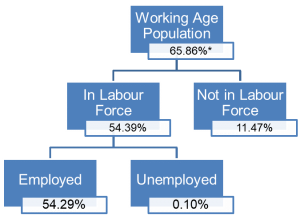 The low unemployment rate may stem from the definition of labor force (which is those economically active in the week previous to the survey, including in production for own consumption) and of employed persons (at least 1 hour of work in the previous week, including unpaid family work). 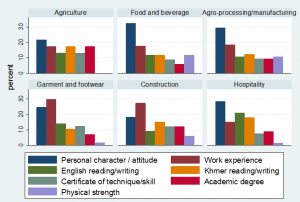 International unemployment definitions are not appropriate for countries with a high proportion of people involved in subsistence farming and/or helping in family businesses. 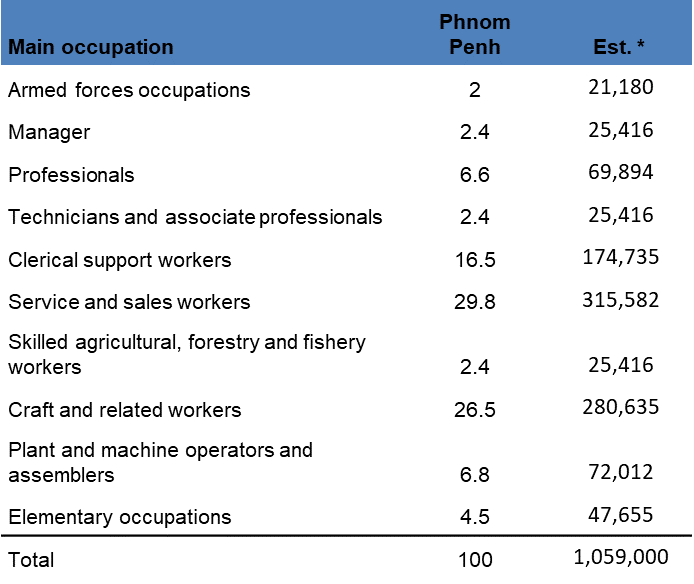 Major occupations of employed population in Phnom Penh are service and sale workers, craft and related worker, and clerical support workers. 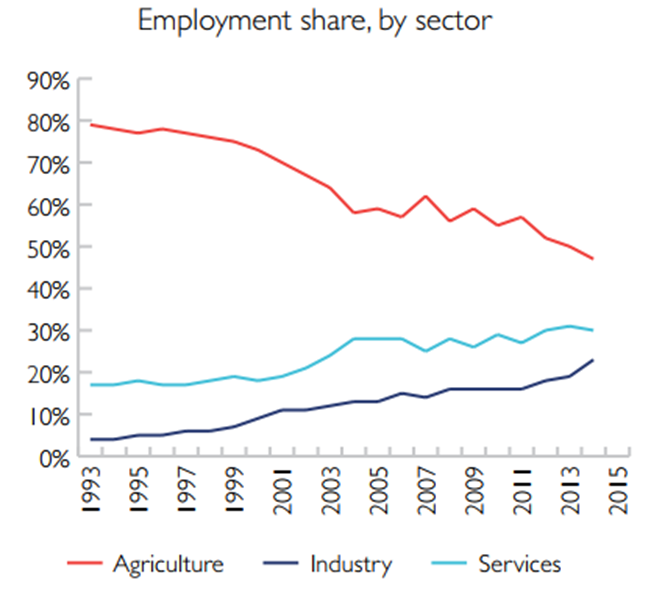 Available sectoral data on employment is spotty at best, but some traditionally large sectors dominate, while some emerging sectors are growing fast. 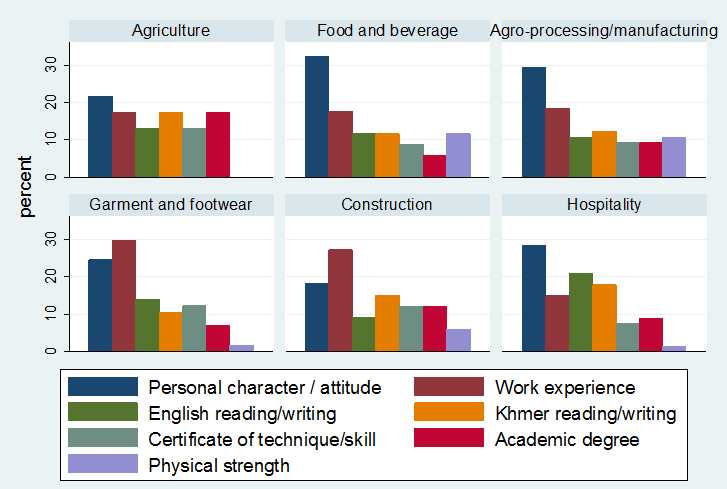 Firms increasingly report the lack of an adequately educated workforce as a major constraint to doing business in Cambodia. The issue of an undereducated work force has resulted in a large perceived skill gap by employers, including many basic ‘soft skills’. Around 200,000 workers who enter the labor market each year are undereducated, with roughly 30 percent having completed primary school. The World Bank found that 46 percent of large businesses identified an inadequately educated labor force as a major constraint. A recent survey in eight provinces plus Phnom Penh found significant recruitment challenges across sectors. 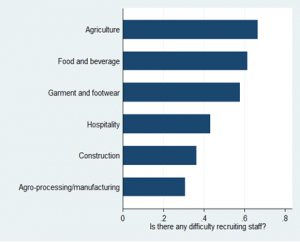 Apart from previous work experience, soft skills and literacy were the most sought after in candidates.